A dear friend asked me to make her grandson’s FIRST birthday cake! She was so excited to have him, his Mommy & Daddy home for a visit and the BONUS of a Birthday party was just too fun!! She shared with me a great bib she found at Jenny’s, one of our favorite gift shops, it was the perfect inspiration for the cake!! I made baby j his own personal cake with orange fondant stripes and blue polka dots and cupcakes for all the family and friends with #1 in fondant and sprinkles! I just LOVE a BIRTHDAY and the FIRST one is Super Special!! Thanks for letting me be a part of it!! 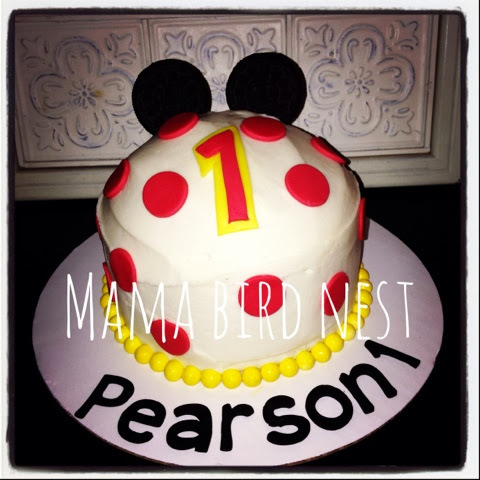 This entry was posted in Uncategorized and tagged 1st birthday, Birthday, Birthday Cakes, cake, Cupcake Tuesday, cupcakes, First Birthday, Hickory Cake Baker, Jenny's Gift Shop, Mama Bird's Nest, party.